Please order from Ron Dethlefson 3605 Christmas Tree Lane, Bakersfield, CA 93306. 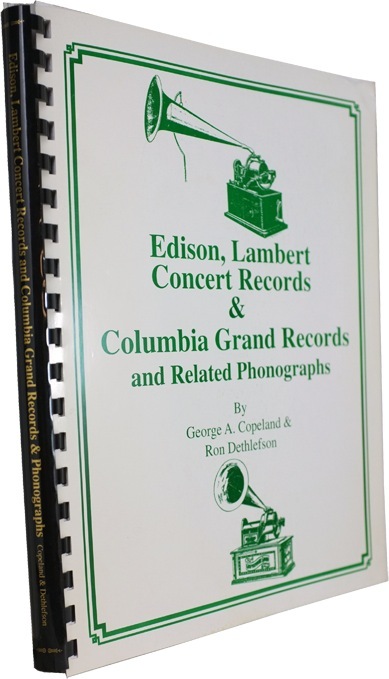 This is the expanded version of Edison, Lambert Concert Records & Columbia Grand Records and Related Phonographs(or, The Five Inch Cylinder Book). A 160 page book covering manufacturing methods, types of phonographs, accessories, foreign and domestic record titles, dating guides, advertisements and catalog segments for these large records and instruments. 175 illustrations, 70 in color. Ring bound with book title on spine. Each book is signed and numbered by its authors. Expanded version limited to 155 copies. Please order from Ron Dethlefson 3605 Christmas Tree Lane, Bakersfield, CA 93306. Please add 15% for overseas shipment. Money order, purchase order or personal check accepted for payment.